Our law firm concentrates its practice on representing clients suffering catastrophic injuries and wrongful death cases in Chicago and the surrounding cities and counties in Illinois. The firm has 38 attorneys that are devoted to bringing negligent persons and corporations to justice for their wrongdoings and we have successfully recovered more than $2 BILLION in compensation for our clients. If you have been injured in an accident in Chicago and are seeking legal representation, contact Goldberg Weisman Cairo at 1-312-464-1234 or reach us 24/7 via our Live Chat options or the “Free Case Evaluation” form on this page. On March 21, 2005, a Local 80 journeyman had just finished nailing off roof sheeting on a new home at a Toll Brothers’ Hawthorn Woods project. As he stepped down from the roof ridge, one of his feet slid out from under him and then the other. He continued to slide down the roof. His body struck a properly constructed and secured toe board that had been nailed into the roof sheeting and to the roof trusses by a member of his crew. Despite the proper securement of the toe board to the roof, the carpenter’s descent from approximately the middle of the roof to the toe board caused the toe board to fail and he fell from the roof’s edge. As a result of his fall, he sustained very serious injuries to his leg, resulting in approximately five surgeries and his loss of trade as a journeyman carpenter. GWC attorneys Daniel Streckert and Christopher Hughes related the carpenter’s story to an OSHA expert to make a determination as to whether there was a basis for a claim against the general contractor, Toll Brothers. 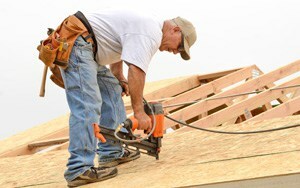 Although OSHA did not require carpenters to be tied off on the roof, there was basis for a claim against Toll Brothers’ for failure to enforce the “interim toe board/slide guard standards” for the size of the roof relative to the pitch of the roof. GWC was able to successfully mediate this Illinois construction accident case with the defendant, Toll Brothers, and a safety consultant. The settlement was for $2 million to the plaintiff, along with the waiver of a workers’ compensation subrogation lien in excess of $800,000 by his employer, Arbuthnot Construction.